The challenge of bringing modern energy to everyone in Africa is a global challenge that requires substantial investments as well as a strong commitment to make the energy sector more effective and efficient within the single countries. 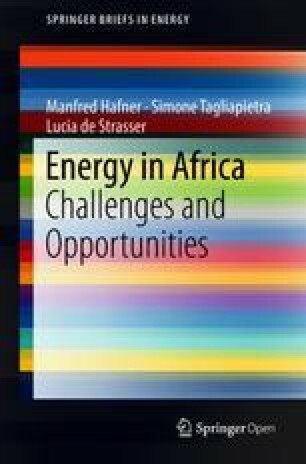 This chapter suggests that both African governments and the plethora of foreign investors have the possibility to improve the situation, taking action respectively in terms of structural reforms (of power utilities and pro-poor subsidies) and in the coordination and streamlining of financial assistance. Notably EU countries and institutions—together with the World Bank Group the largest investor in energy development in the region—could easily reduce the bureaucracy and redundancy of existing electrification programs to achieve greater impact. In this process, the objective of universal clean cooking and the actual investments required to achieve it (particularly in LPG and bioenergy) should not be forgotten. 4.1 Electricity for All in Africa: Which Costs? The United Nations (UN)’ 2030 Agenda for Sustainable Development has set the goal of universal energy access by 2030. Considering the current status of access to electricity in the region, reaching this goal will represent a major challenge for SSA. First of all, on the basis of which technology mix should the em-“powering’’ of Africa take place? To answer this question, the Royal Institute of Technology of Sweden (KTH) and the UN Department of Economic and Social Affairs (UN-DESA) have developed a unique analytical tool: the Universal Access to Electricity Model. Using open geospatial data and taking into account local characteristics, this Geographic Information Systems (GIS) model estimates the mix of technologies that will provide universal access at the lowest cost. The model makes choices on the levelized cost of technologies calculated based on locally adjusted technical data such as distance to grid, distance to diesel sourcing, solar radiation, wind factors, water availability, among others. In granting universal access to power, the model considers grid and off-grid options, five per-capita power consumption scenarios (Tier 1 to Tier 5)1 and two diesel prices.2 The model decides on the least costly option after comparing the costs of connecting to the central grid, to a mini grid, or to stand-alone solutions. The electrification options—grid connections, mini grid and stand-alone solutions—vary from one scenario to another (Fig. 4.1). In particular, as household demand for power increases the relative proportions of grid based and mini-grid solutions increase, at the expense of stand-alone options. On the contrary, in low power demand settings decentralized generating options and stand-alone options could contribute considerably to the achievement of universal access. Reasonably, as diesel prices increase there is a shift to greater deployment of renewable mini-grids, at the expense of diesel based stand-alone and mini-grid systems (Mentis et al. 2017). Least cost electrification mix for low diesel cost and Tier 1 (top left), 3 (top right) and 5 (bottom left); and high diesel cost and Tier 5 (bottom right) in SSA. This seminal model is not only useful to understand how SSA’s power systems can develop in the future, but it is also useful to understand the investment required in the five per-capita power consumption scenarios. According to the model, the minimum total investment requirements to provide power to the subcontinent (with South Africa) amount to 50 billion US$ at low diesel prices and the lowest electrification level, while the maximum investment for universal access reach 1.3 trillion US$ at high diesel prices and the highest tier of electrification (Fig. 4.2). Access split, in bars, and overall investment needs, in lines, for universal access by 2030 for low diesel costs (left); and the same (right) for high diesel costs. The figure of 1.3 trillion US$ investment requirements for the subcontinent (SSA and South Africa) by 2030 for universal access to power in the highest per-capita power consumption scenario, is in line with an estimation made by Enerdata (2017) according to which around 1 trillion US$ will be needed by 2030 to expand SSA (without South Africa)’s power sector in order to ensure universal access to power by 2030. In annual terms, this amount translates into a SSA power sector’s investment requirement of around 70 billion US$ per year by 2030. Ensuring this financing will be challenging, particularly because investment in SSA energy supply remains focused for almost three-quarters on oil sector (Fig. 4.3). Investment in energy supply in Sub-Saharan Africa (2000–2013). Perhaps, the most striking among these historical investment trends is the one related to the power sector. In fact, although spending in the sector has increased over the last decade, annual investment in the SSA power system is currently estimated at around 8 billion US$ per year. In order to reach a good level of universal access to power by 2030, current investments need to increase ninefold. This truly represents a huge step-change. The international public financing made available for Africa’s electrification should be better used, in order to favour the scale-up of international private investments in the sector. SSA countries should be the key drivers of their own energy development. They have the resources to be so, but this potential can only be unleashed by creating sufficient opportunities for investment. This challenge extends well beyond the power sector, involving a reduction of the risks arising from macroeconomic or political instability and from weak protection of contract and property rights. But it also means consistent attention to reform the way the power sector operates, in order to realise the policy ambitions of governments across SSA to improve the reliability and coverage of their power systems. In particular, two are the key reforms that SSA countries should undertake in the power sector: (i) The reform of power utilities; (ii) The reform of energy subsidies. SSA power utilities have so far failed to develop flexible energy systems to provide firms with a reliable power supply and people with access to power. This is mainly the result of the fact that governments have often viewed power utilities as sites of political patronage and vehicles for corruption. Changing this situation represents a fundamental prerequisite to unleash SSA energy transformation. Today, SSA power utilities are not financially sustainable. A seminal study by (Trimble et al. 2016) has revealed that across SSA only the utilities of two countries (i.e. Seychelles and Uganda) fully cover operational and capital expenditures (Fig. 4.4). All other SSA utilities run in quasi-fiscal deficit (i.e. defined as the difference between the actual revenue collected and the revenue required to fully recover the operating costs of production and capital depreciation), and thus need to be subsidized by the state. Sub-Saharan African utilities: comparison of power supply costs with cash collected, 2014 (US$ per kWh billed). Reform is the only way to reduce these deficits and make utilities financially viable. To reach operational efficiency utilities should reduce transmission, distribution and bill collection losses, and at the same time tackle overstaffing. Then, utilities need to increase tariffs, of course starting from large- and medium-size customers, for whom affordability is not as significant a challenge as for small-consumption households. Finally, the introduction of innovative solutions, such as prepaid meters, could improve overall revenue collection. Finally, in order to reform power utilities and ensure implementation, SSA countries should create robust and independent regulatory bodies empowered to hold utilities to account. SSA countries spend every year around 25 billion US$ in energy subsidies (International Monetary Fund 2015). This substantial amount of budgetary resources is mainly used to subsidize inefficient and wasteful electricity utilities and, in certain cases, also to subsidize old forms of energy, like kerosene. Redirecting these resources into productive energy investments represents a vital step in reshaping SSA’s energy systems. In particular, there are two main reasons why energy subsidies should be reformed. First, energy subsidies are inequitable. Being universal schemes rather than targeted schemes, energy subsidies in SSA mostly benefit higher-income groups, as they consume the most. Power subsidies are particularly regressive, because connection to the power grid is highly skewed toward higher-income groups. Second, energy subsidies are profoundly detrimental for the development of energy systems. In fact, they create a disincentive for maintenance and investment in the energy sector, perpetuating energy shortages and low levels of access. Therefore, energy subsidies should be reformed across SSA: they need to move from universal to targeted subsidies, in order to make better use of budgetary resources for pro-poor and development spending and to facilitate the expansion of electricity output. As proved by other experiences in the world—from Iran to Morocco, from Jordan to Tunisia—reforming energy subsides is challenging, but possible (International Monetary Fund 2013). Putting the governance of SSA’s energy sector in order is the starting point for expanding the continent power systems. Without such reforms, international energy companies and investors would indeed hardly jump into SSA energy markets. This is the reason why SSA governments should act first. However, the support of international public finance institutions will be key to ensure the progress of SSA energy transition, notably by contributing to crowd-in private investors into SSA’s power markets. In fact, the combination of political risks (e.g. corruption), commercial risks (e.g. solvability of consumers), country risk (lack of stable power market regulatory frameworks) and lack of adequate power infrastructure, prevent international private investors from scaling-up investments into SSA’s power sector. In this context, international public finance institutions have an important role to play in accompanying private investors, notably via direct financing, blended finance tools,3 or risk-sharing mechanisms. International public finance institutions can indeed provide risk-mitigation and credit-enhancement tools to cover the country risk faced by international energy companies and institutional investors. This risk might change over time, as the political situation in a country evolves. Reducing the risk can enable the country to attract more investment because of lower interest rates, in effect providing an investment insurance mechanism. As a matter of fact, international official development assistance (ODA)4 and other official flows (OOF)5 to the African power sector have tripled over the last decade, increasing from 2 billion US$ to 8 billion US$ in 2015 (Fig. 4.5). International financial assistance to Africa’s power sector, by year (2005–15). The World Bank Group (WBG), the European Union (EU) (i.e. EU institutions + EU Member States) and the African Development Bank (AfDB) disbursed most of the funds in the sector, while players like the United States (US), the Climate Investment Funds (CIF), the Arab Fund for Economic and Social Development (AFESD), the OPEC Fund for International Development (OPEC-FID) and others played a far minor role (Fig. 4.6). Cumulative financial assistance to Africa’s power sector, by player (2005–15). In terms of sectorial destination, it is interesting to outline that the WBG mainly invested in non-renewable power generation, and particularly in coal. This approach might change in the future, as the WBG announced in 2017 its decision to no longer finance upstream oil and gas projects after 2019.6 Meanwhile, the EU mainly invested in renewable power generation (namely hydro, wind and solar) and the AfDB mainly invested in power transmission and distribution infrastructure (Fig. 4.7). Cumulative financial assistance to Africa’s power sector, by category (2005–15). It is also worthwhile to outline the geographical distribution of the various players’ investments. For instance, over the last decade the EU was the main international public investor in North African power sector, followed by a group of players including the CIF, the AFESD, the OPEC-FID and the United Arab Emirates (UAE). The AfDB also played a significant role in the region, while the WBG was only marginally engaged there. In SSA (i.e. without South Africa), the major role was played by the WBG, by the EU and—to a lesser extent—by the AfDB. The AfDB was, on the contrary, a key player in South Africa, together with the WBG (Fig. 4.8). Cumulative financial assistance to Africa power sector, by region (2005–15). However, with a seminal report published in 2016, the IEA shed light on the Chinese investments into SSA power sector (International Energy Agency 2016). The report found that Chinese companies (90% of which state-owned) were responsible for 30% of new power capacity additions in SSA between 2010 and 2015—with a total investment of around 13 US$ billion over the quinquennium. According to the report, Chinese contractors have built or are contracted to build 17 GW of power generation capacity in SSA from 2010 to 2020, equivalent to 10% of existing installed capacity in SSA. In geographical terms, these projects are widespread across SSA, and concerns at least 37 countries out of 54. In terms of capacity size, Chinese contractors primarily focus on large projects. In terms of type of capacity, they primarily focus on traditional forms of energy like hydropower (49% of projects 2010–2020), coal (20%) and gas (19%), while involvement in modern renewables remains marginal (7%). Africa is also part of China’s “One Belt, One Road”. In fact, the initiative does not only include the “Silk Road Economic Belt’’ stretching from Asia to Europe, but also the “Maritime Silk Road’’ linking China and Europe via the Indian Ocean littoral and East Africa. According to Boston University, China has invested about USD 128 billion in energy projects in “Belt and Road’’ countries since 2001. Of this investment, USD 4.1 billion has targeted Africa—predominantly to develop coal-fired power plants. In this initiative, China thus seem not to consider the environmental and social issues that currently prevent the majority of international financing institutions from supporting coal projects in Africa. China’s focus on coal projects—alongside big hydropower projects—make international financing institutions’ support for solar and wind energy projects in Africa even more important. The increasing international financial assistance to Africa’s electrification certainly represents a good news for the continent. However, this is still not sufficient to bridge the gap between the 8 US$ billion factually invested every year in SSA’s power sector, and the 70 US$ billion investment that would annually be needed to provide access to power to all by 2030. As previously mentioned, the only way forward to bridge this gap is to scale-up international private investments, and for this reason domestic reforms are needed across SSA countries to create viable and attractive investment environments. On their side, international financial assistance initiatives for Africa’s electrification should also evolve, in order to have more leverage over private investors, and also over African governments in terms of incentivizing energy market reforms. With this regard, the main issue is certainly represented by coordination. In fact, very many international initiatives are currently ongoing with the similar aim of contributing to the development of Africa’s energy markets and to the improvement of access to power across the continent. As illustrated in Table 4.1, at least 60 initiatives completely or partially devoted to the electrification of SSA can be tracked, originating from Europe, America, the Middle East and Asia. Shell Foundation, Federal Republic of Germany (KfW), The Norwegian Investment Fund for Developing Countries, Norfund, and the Dutch Good Growth Fund (DGGF), GroFin Risk Capital Facility, and GroFin MENA. In this labyrinthine network of initiatives, understanding who is doing what is at best challenging. As also outlined by the (Africa Progress Panel 2015), Africa’s energy needs are poorly served by such a fragmented system. This because funding is generally transferred through overly bureaucratic delivery structures that combine high transaction costs with low impact, thus resulting in most finance to be earmarked for small-scale projects rather than sizeable programmes. A potential way forward to make the best of global financing initiatives for SSA’s electrification could thus be to establish a ‘one-stop-shop’ mechanism to better coordinate the actions of leading players (e.g. WBG, AfDB, EU) and, progressively, of others. Through such a mechanism, project proposals could be treated in a more integrated and efficient way, lowering transaction costs for both applicants and financiers. Through such a mechanism, energy market reforms could also be better stimulated across SSA, for example linking operations in a certain country to the implementation of anti-corruption laws, energy utilities reforms or energy subsidy reforms. The implementation of such reforms would—in turn—allow to further attract private investments, strengthening a virtuous circle that could truly spur SSA’s electrification. Although it is recognized that such centralized mechanisms are difficult to establish and maintain, the World Bank’s State of Energy Access Report (SEAR) (ESMAP), or its Global Tracking Framework (GTF) (World Bank) may offer venues for housing such a function in their future iterations. This need for coordination is particularly urgent at EU level. In fact, as previously illustrated, the EU as a whole represents a top player in supporting Africa’s electrification, alongside the WBG and the AfDB. However, EU initiatives are very fragmented, not only between various EU Member States, but also between the various EU institutions. As illustrated in Table 4.1, part of these initiatives are promoted by the European Commission (EC), part by the European Investment Bank (EIB), part by individual EU Member States either via national promotional banks or national development agencies. Europe’s current fragmented system favors overlaps, inefficiencies and overall higher transaction costs. This European taxpayers’ money would be far better spent if channelled through a unique facility, allowing policy consistency, elimination of overlaps, abatement of transaction costs and, therefore, overall higher efficiency and impact. That’s it: Europe needs a one-stop-shop to make the best of its existing efforts to support SSA electrification. This can be done in 3 steps. The first step in coordinating EU’s support programs for SSA electrification should be made by the EU institutions. The EC and the EIB should progressively channel existing and prospective programs related to SSA electrification into a unique box—that might be named ‘EU Electrify Africa Hotspot’. In the past, a number of different programs have proliferated in this field, often without taking into consideration potential complementarities and overlaps with existing EU initiatives. There is no reason why this situation should be perpetuated. Instead of creating additional initiatives (e.g. as most recently done with the launch of the EU External Investment Plan), the EU should first put the house in order and rationalize its activities in the field. This would allow a more efficient use of European taxpayers’ money, and also allow greater impact in SSA countries—due to larger scale and visibility. No single EU Member State has the capability to impact alone any SSA country’s electricity sector. Considering the size of the investments being made in SSA electricity sector by China and the US, Europe could only be significant by acting together. Acting in SSA electricity sector through a joint European scheme, could allow EU Member States to reduce their own transaction costs, by exploiting synergies with other participants to the scheme. Of course, acting together via the ‘EU Electrify Africa Hotspot’ should not prevent a EU Member State to do less or more, on the basis of its own political and economic preferences and priorities. The ‘EU Electrify Africa Hotspot’ should ultimately be seen, at this stage, as an opportunity to increase visibility and impact of established bilateral initiatives, of which Member States will continue to maintain ownership. But the potential of the ‘EU Electrify Africa Hotspot’ would be fully exploited as the various participants to the scheme will start to emit joint products. Once large-scale blended finance is available, not only larger private investments can be mobilized, but also energy sector reforms can be stimulated. By creating joint public-private partnerships aimed at crowding-in private sector investments into SSA electricity sector—and most notably into mini- and off-grid solutions for rural electrification—EU institutions and Member States could together stimulate those energy sector reforms (e.g. reform of electricity utilities and energy subsidies) that would, in turn, further attract private investments. It is this virtuous circle that the ‘EU Electrify Africa Hotspot’ should ultimately seek to ignite (Tagliapietra and Bazilian 2017). 4.6 The Actual Cost of Universal Access to Clean Cooking? The goal of universal access to clean cooking is proving particularly challenging to pursue in SSA, even more than in other developing regions, and there is a widespread feeling that the problem is not receiving enough attention, also as compared to the challenge of electrification (Energy Sector Management Assistance Program, World Bank 2014; International Energy Agency 2017; SEforALL 2017). A variety of potential improvements from the status quo exist, more or less clean, and more or less feasible to implement, however there seems to be no silver bullet to solve the problem. Once an alternative fuel is available, habits and consumer preferences may still preserve the use of solid biomass. This phenomenon, known as “fuel stacking” (as opposed to “fuel switching”), is changing the perception of what makes a clean cooking policy successful and, as a consequence, where it makes more sense to invest to effectively tackle the problem. So far, much of the progress registered around the world has been achieved by improving access to LPG (i.e. butane, propane), natural gas (i.e. methane), and electricity, but in terms of actual reduction of solid biomass consumption results have been mixed, particularly in the developing world, and SSA is the region where the problem remains the most pressing. As anticipated in Chap. 2, the IEA sees the following solutions to implement universal access to clean cooking in SSA by 2030, in order of potential: LPG, improved biomass (i.e. the use of stoves with a more efficient/less emitting combustion process), electricity, and natural gas. Compared to the global average, natural gas is expected to play a lesser role because of the high costs of gas distribution pipelines, and improved biomass a greater one because of the difficulties of remote communities to access or afford alternative technologies and fuels. Estimating the cost of universal clean cooking is as challenging as—or perhaps even more than—estimating the cost of universal electrification, given the variety of possible solutions available, and possible combinations of them. When looking at past and present clean cooking policies around the world, there are also significant data gaps and inconsistencies in accounting methods that make it difficult to establish the actual costs associated to each policy. The 2017 report “Energizing Finance” by the SE4ALL initiative offers important insights on the current situation based on a clean cooking market assessment in Bangladesh, Ethiopia, Kenya, and Nigeria. Today, most of the finance for clean cooking comes from international financing institutions, followed from a distance by public money and private investments (more foreign, less domestic). The main focus of international donors is on providing cooking devices, and particularly improved cookstoves (which is the most basic improvement). Enterprises selling clean cooking solutions (stoves and/or fuels) find it generally very hard to access financing for their business and note that clean cooking is not being given enough policy support beyond financing, even when it comes to raising awareness among consumers (SEforALL 2017). The IEA provides a back-of-the-envelope calculation of the investments needed to solve the problem globally. They reckon that achieving universal access to clean cooking by 2030 would require approximately 62 billion US$ (i.e. 40 billion US$ more than the 20 already allocated through current policies). This equals 3 billion US$ per year, which is roughly the same amount considered in the SE4ALL report (4.4 billion US$, based on an earlier IEA estimate). This sounds like a reasonable sum, particularly if considered along the cost of achieving universal electrification, which is estimated to be around ten times more expensive (International Energy Agency 2017). However, this estimate excludes infrastructural costs. These may be significant, particularly in SSA where the starting point is a minimal infrastructural base of ports, pipelines, rails, and even roads, and particularly for those cooking solutions that rely on ad hoc distribution networks, like natural gas, electricity, and to some extent LPG. Let us consider the infrastructural costs associated to these three solutions. The cost of electrical cooking basically falls under the umbrella of electricity for all (see Sect. 5.1), which means that—net of the cost of electrical stoves—investing in electrification basically counts as investing in clean cooking. It should be noted that electrical cooking is a Tier 4/Tier 5 use, hence its uptake will be linked to grid expansion more than to off grid solutions. However, when it comes to natural gas, and to some extent LPG, the above cost estimate may be falling significantly short. The present scarcity of SSA gas markets (and relative infrastructure) makes the distribution of piped natural gas to households quite problematic. In fact, residential demand is a consequence of the presence of a gas distribution network, but the construction of natural gas distribution networks in SSA is generally challenging (see Chap. 3). Lack of supporting infrastructure is also a great barrier for LPG, which supply chain necessarily involves the presence of importing terminals (if not production i.e. refinery and/or gas processing), cylinder filling stations, pressurized storage and road distribution (World Bank et al. 2017). Clearly, the provision of clean cooking cannot be the only driver for the construction of such infrastructure, which is why internalizing their related construction cost into the cost of a clean cooking policy would result in an over-estimation. Still, the presence of infrastructure is a prerequisite to the deployment of clean cooking solution and this should be taken into account. This leads us to a few considerations on clean cooking investments in SSA. First of all, mirroring the process of rural electrification, gas-based cooking could spread around productive uses that can guarantee a certain entity and continuity of demand. In the case of piped natural gas, these can be power production or industrial users; for LPG they can be small and medium businesses of various kind (potentially even agricultural businesses in rural areas). In SSA, like anywhere else, the future of piped natural gas will be largely tied to cities. For LPG, targeting urban and peri-urban areas first seems a sensible approach too. Investments in improving the state of roads will be necessary (though not sufficient) for the potential uptake of LPG in rural areas given the remoteness and scattered nature of settlements. While it is not realistic to plan for natural gas development around residential uses, it is reasonable to consider clean cooking as a possible benefit from the development of domestic gas markets. This should be a further motivation for gas producing countries to consider the development of domestic markets and regional trade, as opposed to the option of extra-continental export. However, particularly in rural areas, other solutions may be more straightforward, like biogas and improved cookstoves (wood or charcoal). These solutions are associated to shorter production-consumption distances and can be easily promoted through (and simultaneously add value to) existing agricultural and fuelwood value chains. All clean cooking solutions, from the most advanced to the most rudimentary, hold the potential to stimulate local economies. It seems therefore important to ensure access to credit for entrepreneurs and also, crucially, to maintain a vision of the value chain that investments should ultimately establish, be it LPG, bioenergy, or waste. It is clear that governments, international financing institutions, and foreign investors, should take the issue of universal clean cooking into greater consideration. This means adopting a more systematic approach to the evaluation of clean cooking options and, as a consequence, a frank dialogue over the investments needed to achieve them. As the SE4ALL report puts it, particularly “investments in ethanol, LPG and natural gas for cooking require long-term, industry-building perspectives” (SEforALL 2017). Along the lines of the tool presented at the beginning of the chapter, it would be interesting to develop a cost optimization exercise for the distribution of gas-based cooking solutions in SSA, using geospatial information on distances. Given the potential synergy between electrification and clean cooking, the exercise may also reveal opportunities for infrastructure optimization. Representing one of SSA’s major barriers to socio-economic development, electrification certainly represents a priority to solve Africa’s lack of access to energy. However, there is also another important implication of Africa’s electrification: climate change. According to the United Nations, Africa’s population is set to grow more than anywhere else in the world, i.e. from 1.2 billion in 2015 to 2.5 billion in 2050. Accordingly, energy demand could also be expected to strongly grow. Getting Africa’s future energy mix sustainable is thus crucial to avoid a negative impact of climate change. For this reason, a more efficient contribution in fostering Africa’s sustainable electrification should also be seen by international and European players as an important component of their overall climate change mitigation action. In particular, the role of modern bioenergy and investments in the sustainability of the forestry sector should not be forgotten, as they can significantly contribute to upscale global climate mitigation efforts. With this regard, the potential for a new global North-South financial cooperation should also be outlined. Spare financial resources from Europe and North America could indeed be invested in ‘green’ assets in the global South, and notably in Africa. This would allow investors to earn higher returns, while effectively contributing to improving living conditions for the world’s poorest, and to mitigating climate change. As previously stated, it is up to African countries themselves to ignite such a virtuous cycle—notably by making the key reforms necessary to create a favourable investment environment. Tier 1 provides approximately 20 kWh per household per year while Tier 5 provides 2,195 kWh. Indicatively, in Tier 1 households can only have task-lighting and recharging a cell phone or a radio; in Tier 5 households have enough electricity to enjoy general lighting and continuous use of heavy appliances, such as refrigeration, air conditioning and eventually cooking. From Tier 1 to Tier 5, scenarios increase available amounts of electricity incrementally. A household size of 5 is assumed. The model assumes two international diesel prices, 0.32 and 0.70 US$/l, used to calculate diesel costs in different localities. Blending’ is a mechanism that links a grant element, provided by official development assistance (ODA), with loans from publicly owned institutions or commercial lenders. ODA are defined as flows of official financing administered with the promotion of the economic development and welfare of developing countries as the main objective, and which are concessional in character with a grant element of at least 25% (using a fixed 10% rate of discount). By convention, ODA flows comprise contributions of donor government agencies, at all levels, to developing countries and to multilateral institutions. ODA receipts comprise disbursements by bilateral donors and multilateral institutions. OOF are defined as official sector transactions that do not meet ODA criteria. OOF include: grants to developing countries for representational or essentially commercial purposes; official bilateral transactions intended to promote development, but having a grant element of less than 25%; and, official bilateral transactions, whatever their grant element, that are primarily export-facilitating in purpose. Only in exceptional circumstances consideration will be given to financing upstream gas in the poorest countries where there is a clear benefit in terms of energy access and the project fits within the countries’ Paris Agreement commitments. See World Bank (2017). This is the case of China.aiddata.org, a collaborative online platform that seeks to make information about Chinese development finance flows to Africa more accessible and usable. The platform collects, synthetizes and standardizes data from journalists, scholars, government officials, business professionals, and local community stakeholders.